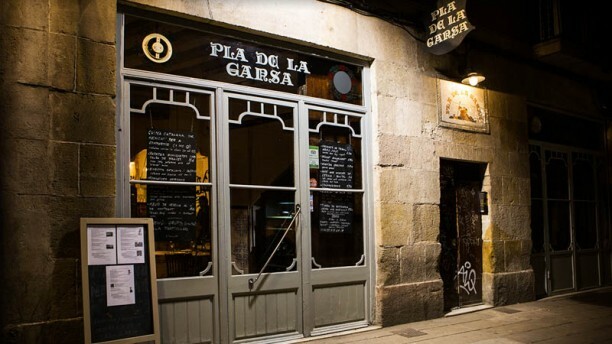 El restaurante Pla de la Garsa te espera en El Born de Barcelona para vivir una experiencia auténtica. Buena comida, servicio atento en sala y el valor añadido de estar en uno de los barrios más eclécticos de la ciudad condal resultan motivos más que suficientes como para convertirte en un asiduo. La Paleta de cremas para untar, la Mini fondue de crema suave de anchoas (Bagna Cauda), el Surtido de Embutidos artesanos, el Meloso de Ternera al vino del Montsant y la Cata vertical de tres quesos son platos identificadores de una cocina tradicional catalana que ha evolucionado a los tiempos más modernos. El interior conserva detalles de casa antigua y un salón especialmente pensado para los grandes grupos. La gente del restaurante Pla de la Garsa trabaja con la intención de que tu paso por El Born sea de lo más especial. ¡Y vaya si lo consiguen! Fabulous meal. Great environment and the service was top notch. Local cuisine beautifully prepared. Very enjoyable experience. Would definitely return and recommend. Excellent Catalan cuisine. We made reservations for 7 pm which we fully understand is very early in Spain. We had the restaurant to ourselves until we left at 9:30 pm. All of the dishes and the wine were exquisite. Highly recommend! I have eaten here twice before and rate it as the best restaurant I have ever experienced for food, atmosphere and whatever else you want to toss into the mix. That includes places in Italia which is saying a lot. Whenever I return to Barcelona, I'll return to Pla de la Garsa! We had the classic menu and we have mixed feelings about this. We really liked the anchovy fondue, however, it was spoilt by the tender cuts of beef coming next that were totally tasteless. The service was acceptable but it'd be nice to get some more attention. Also we had to ask for a new set of cutlery as they weren't changed between the fondue and the beef dish. Elaborate tapas served in an intimate, cute setting. Tasty food but portions are too small for the price. Every part of the meal was great. olive tepenade to start. Vegan mushroom stew for me, duck with cherry for my husband. Nice, inexpensive wine selection. The candied figs for dessert were divine. The building is 17th century and cozy. They have excellent cuisine with very distinct plates. I recommend the menu for 2 that it has a big variety of plates and you can taste a bit of everything in their menu. Very good food, nice environment. Service personnel were great, dishes came out unevenly which was distracting from the overall meal. We went there twice; first time perfect, second disaster because meat was heated ( Iberian feather). Boss told us that are not preparing that dish every day....it was prepared 3 days ago. Very Nice atmophere, Nice service, excellent Food and wine. We had a wonderful evening. Lovely place that felt authentic dnd welcoming with a great range of local disges and excellent service. Rico pero nada especial. Ambiente tranquilo y agradable. Best meal I’ve had in Barcelona by a country mile. The Salmon carpaccio with smoked mayonnaise is one of the best dishes I’ve ever had. GO. You have to try the anchovy cream fondue!